It turns out the unpleasant surprise for Nick Young went beyond learning he may sit out for six to eight weeks after tearing a ligament in his right thumb. Lakers coach Byron Scott also forced Young to participate in Saturday’s practice in both defensive and conditioning drills. “I thought I had the day off today.” Young said, laughing. But Young didn’t for one simple reason. Young injured his hand during Thursday’s practice after trying to steal the ball from Kobe Bryant. But instead of retrieving the ball, Young’s right thumb hit Bryant’s elbow. Young later reported Bryant boasting, “I’m a man of steel” considering the contact eventually forced his teammate’s surgery. During Saturday’s practice, Young wore a brace to support his thumb. He will then have surgery on Monday with Dr. Steven Shin of the Kerlan-Jobe Orthopaedic Clinic. Young reported Bryant and Scott were among the first to text him to offer support. But apparently there is a teachable lesson behind this. Scott’s feedback and insistence that Young practice represented one of many reasons why Bryant has supported him as the Lakers’ coach. Beyond Scott serving as his rookie mentor, Bryant believes his strict demeanor will help change the Lakers’ culture. After all, Scott had openly envisioned Young could win the NBA’s sixth man of the year award after finishing last season averaging a team-leading 17.9 points per game. Bryant had earlier touted Young as a “really big piece of this team” because of Young’s secondary scoring, better commitment to defense and improved conditioning. 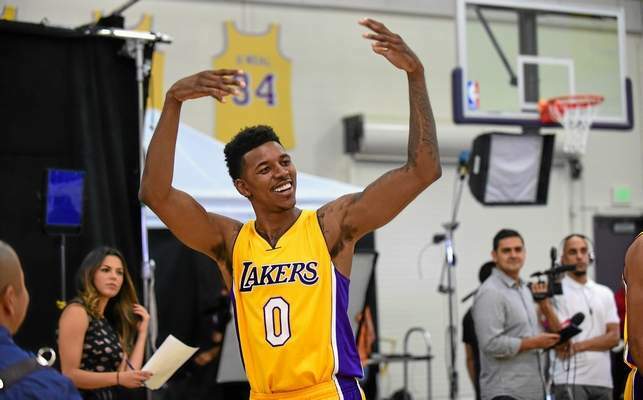 So how do the Lakers handle Young’s absence that Bryant described as a “big loss”? Scott envisioned Bryant will likely play some more time at small forward, while dismissing any notion Jeremy Lin might slide over to that spot. Wesley Johnson will still start at that position, while newcomers such as Jordan Clarkson and Wayne Ellington could see time. Injured forwards Ryan Kelly (strained left hamstring) and Xavier Henry (back spasms) still remain sidelined, though Scott believed Kelly could begin practicing as early as Thursday.